Apple Mac OS X comes with inbuilt useful features like sharing the internet with your friends with most of the options inbuilt and you just have to set them up to keep them in working. In this case you will have to make sure that you either have a Airport Extreme Router which is sold by Apple or else a dual-band powerful wireless internet router which can broadband your wired internet connection. You also need to make sure that the Internet Connection which you are planning to use is active and in working. 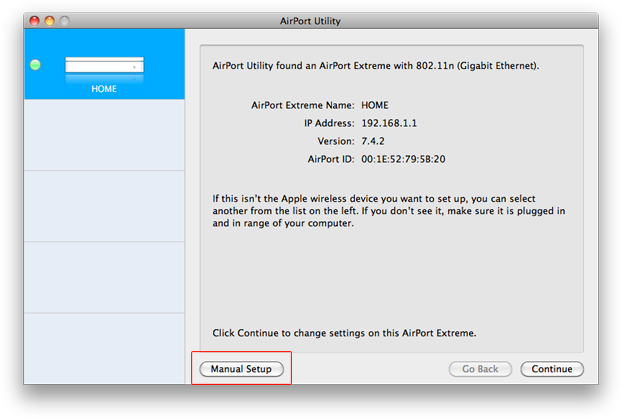 Now to get started you will have to click on the Airport Utility and click on the ‘Manual Setup’ box which would overcome all the automatically set default settings and would ask you to configure most of the available options. Next you will be shown with a list of different options under the ‘Guest Network’ menu option. Tick on ‘Enable Guest Network’ & also Tick on ‘Allow guest network clients to communicate with each other’. This makes sure that you can allow your friends or family to access to your shared internet connection, but you also need to make sure that you have setup WPA or WPA2 Guest Network Security so that unauthorized access to the connection is not possible. Under the drop down options select the ‘WPA/WPA2 Personal’ security level and then enter a Alpha-Numeric Password which is of atleast 10 characters below twice to set it up. These security levels make sure that the wireless network is encrypted and its quite secured and less vulnerable to attacks. Once a stronger passkey or password is setup you can proceed to click on the ‘Update’ button which would restart the router and after a few seconds to minute the connection will be established again and this time it makes sure that your guests would be able to access to your connection. They will find this new connection under the ‘Airport’ section with the name you had earlier assigned.